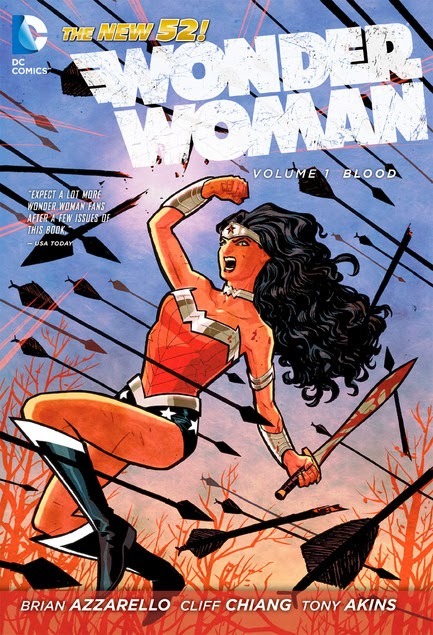 "The first six issues of the critically acclaimed new WONDER WOMAN series are collected in hardcover! Hippolyta, queen of the Amazons, has kept a secret from her daughter all her life – and when Wonder Woman learns who her father is, her life will shatter like brittle clay. The only one more shocked than Diana by this revelation? Bloodthirsty Hera – so why is her sinister daughter, Strife, so eager for the truth to be told?" I wasn't sure if I was going to read this series; I haven't been a fan of WW since the 70s version, but when Kindle had a $5 sale on Volume 1s I couldn't resist picking up the volumes of the characters in the JL and Batman Family I didn't already own. I like Greek mythology a lot so was interested to see where the new 52 would take Diana's story. This first volume is heavily mired in Greek mythology and other than Wonder Woman all the other characters are Greek Gods. I really enjoyed it. I'm not really familiar with her background story except for the Amazon/Paradise Island connection,so don't know if this whole Gods history is new or not but I looove it! Diana's family is both broken apart and expanded here while we (and she) learn the truth of her background and why she leaves Paradise Island for good. She has already taken the persona of Wonder Woman when we meet her and she goes off to be WW, no longer Princess Diana, with a current responsibility to protect a certain young human girl and in cahoots with a few of the Olympians to get back at Hera. I absolutely adore the representation of Hades, totally awesome depiction! This ends with Hades ticking WW off and the next volume promises to have WW going to Hell to face off with him, so I am definitely off to the next volume. 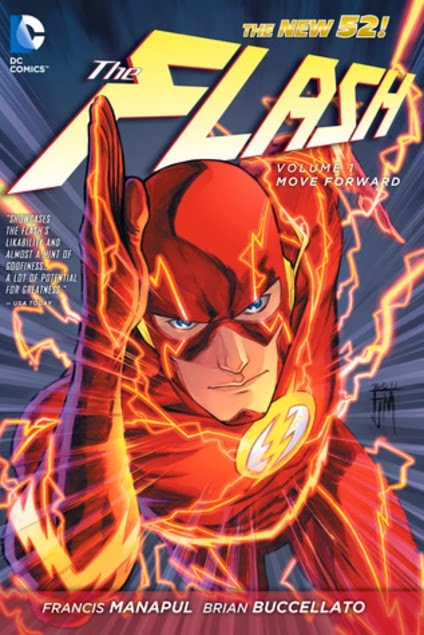 "In this first DC COMICS – THE NEW 52 collection of THE FLASH, Mob Rule wages a campaign of crime across Central City, plunging the city into darkness! The only way The Flash can save his city is to make his brain function even faster than before – but as much as it helps him, it also comes at a steep price. • Collects issues #1-8 of the original monthly series." I was so looking forward to this one. Flash is one of my favourite Justice League members. I like his humour and light-heartedness especially. Boy, was I disappointed. Flash here is so serious and there was virtually no humour. For the plot, it was pretty boring for the most part delving into ... sheesh, I read this yesterday and am having a hard time even remembering most of it today. So, the plot delves into how his speed works and whether his brain is as fast as his body. The Mob Rule as bad guys was pretty lame but there is a second storyline that comes into play partway through that perked my interest. Captain Cold shows up and references to certain other Rogue members are made. Yeah! Then a very interesting background story is introduced about Gorilla Grodd. While I didn't like (and can hardly remember) the first part, the second part makes me want to keep going with the series and we'll just have to see how it develops. BTW, this is fantastic art by Manapul which helped me get through the boring parts.